Trump said the United States intends to remain a steadfast partner of Saudi Arabia to ensure the interests of the United States. 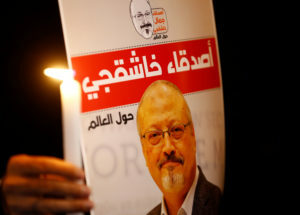 U.S. intelligence officials have concluded that bin Salman, the kingdom’s de factor leader, ordered the Oct. 2 killing, according to a U.S. official familiar with the assessment. Others familiar with the case caution that while it’s likely that the crown prince had a role in the death there continue to be questions about the degree to which he was involved. The U.S. earlier sanctioned 17 Saudi officials suspected of being responsible for or complicit in the killing, but members of Congress have called for harsher actions.